Today was our homeschool group's Brainquest Bowl. 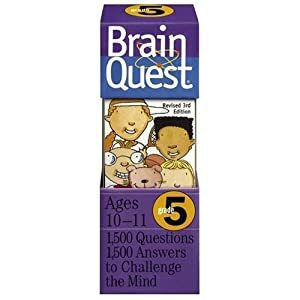 In spelling bee type fashion, kids answer questions from Brain Quest cards. This was The Boy's second year participating. Last year, he finished in 2nd place. This year, he didn't fare quite as well, but he did make it up until right before the final 3. After answering a Bible question, The Boy looked over at me quite pleased with himself. Everyone who competed got a goodie bag.